Factions seeking to manipulate the system for control. By the mid-second century B.C. 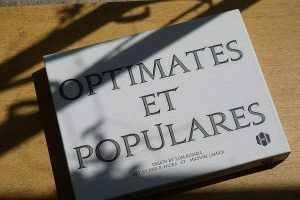 the aristocrats who traditionally made up the ruling class in the Roman Republic had adopted the epithet “optimates” – the best men , or “boni” – the good men, following the Greek model of arisocratic rule. The terms implied a moral or social superiority over those of lower class who had gradually gained a stake in the organs of government since the so-called “struggle of the orders” in the third century B.C. Despite the increasing democratisation of the Republic, this sense of social superiority went unchallenged until the tribunates of Tiberius Sempronius Gracchus in 133 and his brother Gaius ten years later. With the Gracchi building up the class of equites in to a political force, the superiority of the senatorial optimates was denied, and from then on more ambitious politicians were prepared to use the people rather than the senate as a political base. 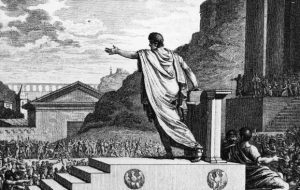 The populares (singular= popularis) tended to use the assemblies of the people for the passage of their laws, rather than deferring to senatorial authority, and claimed to champion liberty against factions in the senate. They wanted to extend voting rights, relieve poverty andgain popular support for agrarian, colonial or grain laws. Their optimate counterparts desired adhesion to conservative maesures based on the old oligarchic model, and used the term popularis in a derogatory sense to imply a demagogue who aimed at tyranny. In practice, and especially in the final years of the Republic, the principles that lay behind the advancement of popular measures could become secondary to the advancement of one’s own aims and one’s own political advancement. The tribune M.Livius Drusus in the 90’s used popularis methods to gain optimate ends, and some aristocrats in the age of Caesar and Cicero had no qualms about using the power of the people to manipulate the system, not to improve it. The career of P. Clodius Pulcher showed just how much the people could be used for one’s own ends. It is important to note that the optimates and populares were not “parties” in the modern political sense, but were rather “factio” in the Roman sense of the word, a collection of politicians often gathered around an unofficial leader with shifting political aims. A member of one faction could quite easily transfer himself to another, or a faction as a whole could adopt measures it had previously opposed. Originally published by Etrusia-Roman History under the terms of a Creative Commons license.